The Snooty Snout Toe Caps are a type of toe guard that cover the entire toe of your skates. They are handmade in the UK and are made of durable leather. They can be bought in many different colors, and you can also get them custom made if you want a particular pattern or image. I bought mine in red, to mach the colors of my league. They looked really good to start with, but the color quickly faded where the toe guards were worn the most. They also leave red marks on the floor, which isn’t so good. Other than that, they are great. They cover the toe completely and they stay in place. 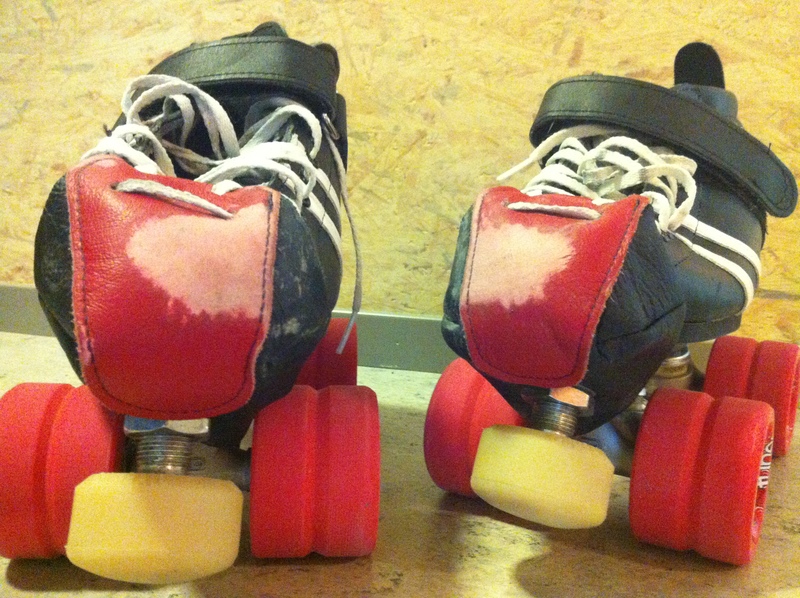 I haven’t gotten a single mark on my skates since I put them on. They may be a tiny bit difficult to put on, since you have to cut a hole for your toestops yourself. I also spent some time figuring out the best way to lace through them, since there were no directions on how to do that, but it was easy to figure out, not hard at all. The only thing that bugs me with these is the fact that they (at least my red ones) leave marks on the floor, other than that they are perfect! So, practice on monday was awesome. I had so much fun that me and some of the girls stayed after practice was finished to practice further some of the skills we went through on practice. I managed to hurt my tailbone, though. It was the stupidest fall ever as well. We were practicing turn around toe stops, which is something I can do now, maybe not perfect, but still. This time I managed to turn around, but then my brain just shut down, and my feet crashed into each other, and I fell backwards. It did hurt a little, but not very much. But the next day, I had serious problems sitting down and standing up. What a painful day that was, especially since I had to sit through four hours of continuous lectures in developmental psychology. Thankfully, it was really interesting. Today my tailbone hurts less, but it is still painful. I really hope I’ll be able to attend practice today. My plan is to show up and just try, and if I can’t do it I’ll sit and watch. I also hope I’ll be able to go to the movies. Because tonight, Nidaros Roller Derby is organizing a viewing, where they are showing the derby documentary Derby Baby! I’m so excited! So, at yesterdays practice I had the total opposite experience of what i felt on mondays practice. Today absolutely everything was fun and easy, and I felt that I could do a lot of stuff. We basically did much of the same stuff as last practice, but I guess I was in a different mental state, so everything was much easier. I’m starting to feel more comfortable in derby now, both as a skater and as a member of the league. 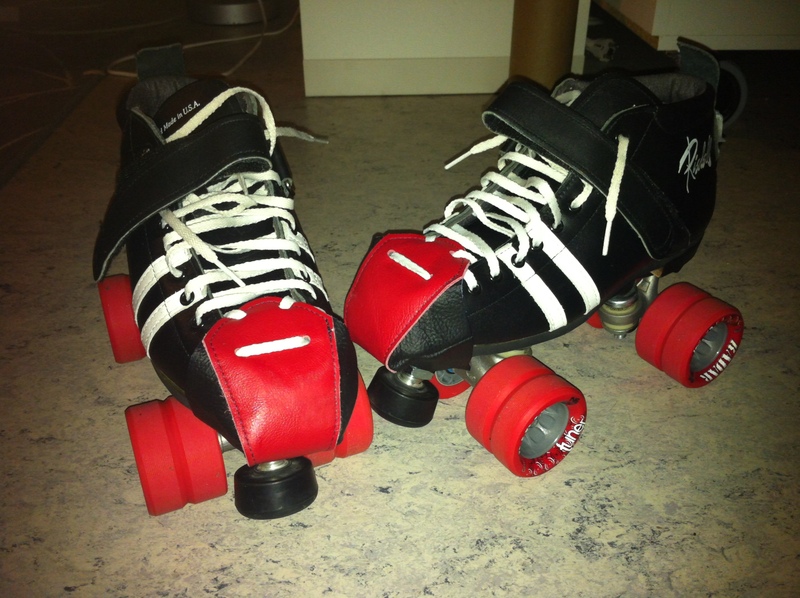 I feel comfortable on my skates now, I know I can stop and fall adequately, so I’m not afraid to try new stuff. And as a member of the league I’m starting to get to know the other fresh meats more, and I’ve also met some more of the veterans. Everyone seems really nice, and I’m looking forward to getting to know everyone. I’m starting to feel like I belong. I also have some pathetic pictures to upload here, but its better than nothing. Here we are practicing juking, you can see the cones we were to navigate around on the floor. As you can see on the picture, our practice venue has these scary columns. I’ve heard of at least one veteran who has smacked into one of those during a scrimmage. That sounds really painful. Luckily, the scrimmages are now held in another location. I’m sorry for the bad pictures, will do better next time. I can take some pictures of myself in my gear or something, or some “artistic” pictures of my skates with some pre-set hipster-filter. I just didn’t want to be too pretentious, but hey, I’m already writing a blog so what the hell. So, on monday we had another practice. After the kickoff being so intense, it was weird having to wait a week before I was able to skate again. So, at practice on monday I felt really uncertain during warm-up. It was the weirdest experience. It felt like I couldn’t do anything. My crossovers were nonexistent and I didn’t dare picking up speed in fear of falling. After warm-up, the first thing we started working on was crossovers. I continued to feel like a klutz, but after a while one of our teachers came and corrected my derby stance, and everything clicked in my head after that, and I was back to where I was last monday, skating-wise. I guess some practices will be harder than others, and I’m glad I got to experience how that feels like and that it is possible to snap out of it. Next, we worked on the different stops. Plow-stop, T-stop and turn around toe stop. All of them are definitely getting somewhere. Not perfect any of them, but I’m pretty sure of what I need to do to improve them. After that we worked on different falls. Falls are fun! And not very hard I think. Except for the 180 knee fall, which is still a little uncontrolled for me. And for the first time, we got to try a baseball slide. It really looked much harder than it was, but it’s still hard to do perfectly. When doing it at much higher speeds than we did, it’s really important to not get anything but you pads on the floor, and that requires good core strength. It’s almost supposed to look like the sideways plank exercise. Last, we did a endurance exercise called the pyramid. We were paired up, and were supposed to push and drag or be pushed or dragged around the track first once, then twice and so on up to five times around the track, and then down again. It was really tiresome, but it was more the muscles in my lower back that killed me rather than my lack of endurance. Which is sort of comforting. Time to strengthen those lower back muscles! On october 8th and 10th there will be a skill test, where we will be able to advance to level 1 (all fresh meat start on level 0), and the practices until then will mostly focus on the skills required to pass that test. Which is really basic stuff, but fun non the less. Next practice, I WILL try to take at least one picture, as I know how discouraging it is to read a wall of text. I tried to steal a video from facebook of us freshmeats doing baseball slides, but didn’t figure out how to embed it on here. Ah, well. Apart from the fresh meat bootcamp last weekend, there has only been one practice on skates this week. The one practice we had on skates was last monday. This time we were in another venue, with slipperier floor, and it took some getting used to after skating on the stickiest floor ever during the bootcamp. It was a lot of fun, we mostly worked on t-stops and plow stops. And then we played some games where we got to practice gliding on one foot and crossovers. We were supposed to have a practice on wednesday as well, but it was cancelled, due to some event being held in the venue we use for practice. But, we still made the best out of the situation, and had a NSO and rules night (NSO meaning non skate official, they count points, keep track of time in the penalty box and so on). One of the refs and us fresh meats gathered to sit and talk about NSO’ing and rules. In our league, one of the requirements for reaching a new level is to participate as an NSO at scrimmages and bouts. This is because NSO’ing teaches us a lot about the rules of the game, and also so that the league has NSO’s for bouts and scrimmages. 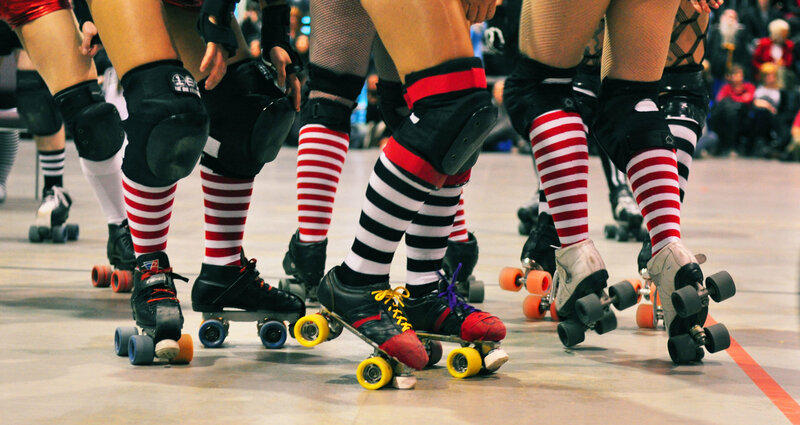 If it hadn’t been for skaters NSO’ing, the league would only have like one or two NSO’s. The NSO and rules night was interesting, and I learned a lot. 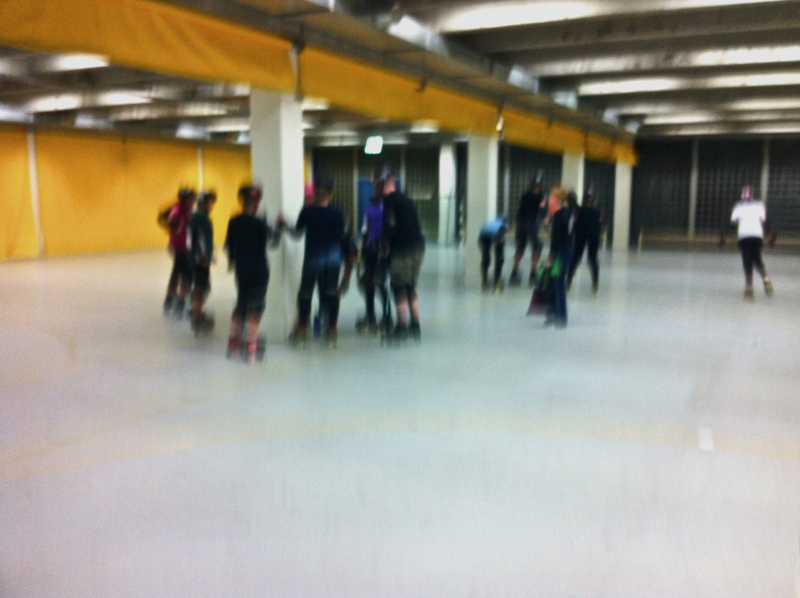 And today, there was a scrimmage-practice for the advanced skaters, and me and some other fresh meats were there to be NSO’s, and to put our newly acquired knowledge to the test. I really learned a ton, and it wasn’t as hard as I had thought. And, I got to watch the veterans skate, which was really fun! Some of them are so talented, its incredibly entertaining to watch them skate. I cannot wait until I also can skate with such elegance! 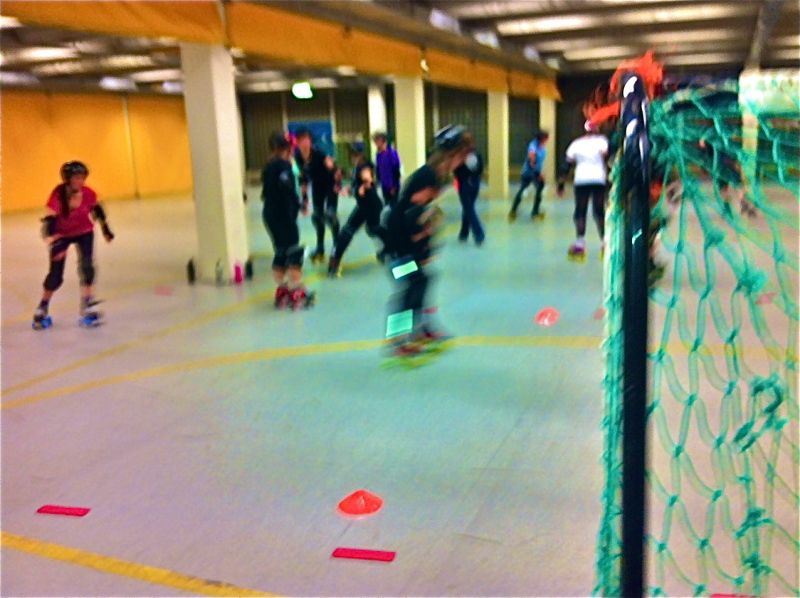 So, this weekend derby started for real with a Fresh Meat Bootcamp for all new members of the league. It was very much fun, but also extremely tiresome. First off, the trainers introduced themselves and said welcome. Then we all warmed up and stretched, before we were divided into three groups. Basically, the purpose of the weekend was that we were to go through all the minimum skill requirements. Not so that we were supposed to master them immediately, but to get an idea of what to expect from training. First, my group started with falling, stepping and gliding on one foot. Then we proceeded to learn about stops, and after that we learned about sticky skating and crossovers. I feel that I learned the most from learning about crossovers, since I have practiced most of the stops on my own, and falling isn’t that much of a challenge. I actually have some kind of a crossover pinned down now, but I still have to make it more smooth and fast. Then we had lunch, and then continued to learn about juking, cutting and weaving. After that we learned about backwards skating, jumping and turn around toe stops. The floor we skated on during the bootcamp was incredibly sticky, so jumping was easy, while skating backwards was nearly impossible. I also think tomahawks and turn around toe stops are kind of hard, but I definitely saw an improvement in myself. After that we learned about leaning, and did some squats. I found that leaning was very much fun, the first kind of “blocking” exercise I’ve done. After that, we stretched out again, and went home. Everyone was extremely tired and sore after 7 hours of skating. Day 2 consisted of more “advanced” exercises. We learned about giving pushes and whips, how to take care of our equipment, and how to pick up and control speed. Then, we started to learn about skating in a pack. That was a bit scary, especially since we are total newbies, and everyone picks up their feet when they want to gain speed. That’s not what you should do in a pack, since you skate so close, and someone will probably skate into your foot if you pick it up. Then, we put on our shoes, and learned about blocking. After that we played sock (or shoe) derby. That was so much fun! We then had lunch, and after that learned to block while on our skates. We ended the bootcamp with a scrimmage. We are not actually allowed to scrimmage yet, since we haven’t passed our minimum skill requirements, but we played a version were only positional blocking were allowed. Scrimmaging was so much fun, and I think it made everyone who participated more motivated to learn so we can scrimmage again. After this weekend my muscles are incredibly sore. I can hardly walk. I also had some bad luck during the warm-up on day two, and my shoulder dislocated. I dislocated my shoulder for the first time many years ago, and sadly, once it has been dislocated, it’s much easier for it to dislocate again. This time I meant to do a four-point fall during a game we played, and landed kind of funnily on my arm, and so it dislocated. It doesn’t hurt as much as it did the first time, and I can pop it back on my own now, but its a really freaky experience, feeling your shoulder halfway down your upper arm. Anyway, the combination of dislocating my shoulder, and then using it for blocking has now made it really really sore, and I can hardly move it. I think it’s just the muscles around the shoulder that are exhausted, but those are what keeps the shoulder in place, so I’ll have to rest it and be careful. Then I’ll have to start building some muscle around that shoulder again, as I don’t want it to dislocate every time I fall funny! There was way to much happening for me to take pictures, and every brake I was too busy emptying my lunchbox to photograph. But, here is a picture I shamelessly stole from one of the veterans on the team. Me at the front, everyone listening intently to the trainers.